April 27, 2017 – The Health Department today launched a new media campaign educating New Yorkers on the dangers of secondhand smoke at home and encouraging them to make their home smoke-free. Secondhand smoke can enter apartments or common areas through shared ventilation systems, air spaces, windows and hallways. Appro ximately 35 percent of New Yorkers report smelling smoke in their home coming from another apartment or outside. Adult non-smokers exposed to secondhand smoke have higher risks of stroke, heart disease and lung cancer. Children exposed to secondhand smoke have higher risks of asthma attacks, respiratory illnesses, middle ear disease and Sudden Infant Death Syndrome (SIDS). The media campaign will run through May 21 on bus shelters, in newspapers, on the Staten Island Ferry and on television. The video version of the campaign is available here. This media campaign is aligned with the recent smoke-free rule passed by the U.S. Department of Housing and Urban Development (HUD), which will require public housing authorities nationwide, including the New York City Housing Authority (NYCHA), to adopt smoke-free policies. What can New Yorkers do? Let your landlord or managing agent know you support going 100 percent smoke-free in your building. If you are a tenant, do not smoke or allow visitors to smoke in your home. If you are exposed to secondhand smoke in your building from other tenants, document the problem and speak to your owner or managing agent and neighbor. Consider a friendly, constructive approach and try to suggest solutions. If you smoke and want to quit, call the New York State Smokers’ Quitline at 1-866-NY-QUITS or visit nysmokefree.com for help. 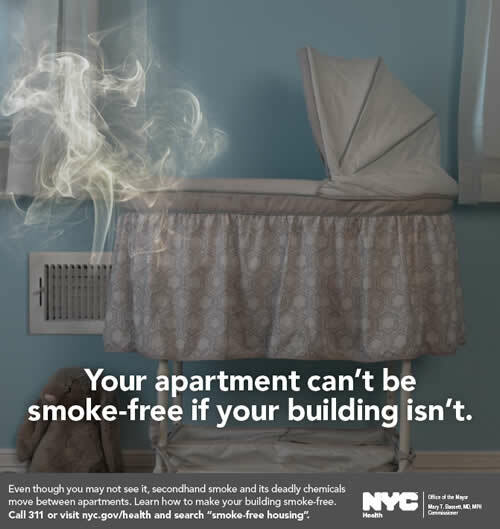 For more information on smoke-free housing, search “smoke-free housing” on nyc.gov/health. This media campaign is made possible with funding from the Centers for Disease Control and Prevention.